Spent being the operative word. As in spent money. I didn't really plan to go to any yarn stores on vacation. I have more yarn lined up for projects than I know what to do with. And my brain is about to explode with the ideas. But the man wanted to stop at a brewery he had visited a few weeks prior to pick up some of their "hop bomb" beer. And there was a yarn store right there! Unfortunately I could not buy anything at this store. They were having a knit-in of some sort and couldn't be bothered to greet me at all. Although I did get some dirty looks. And just to make sure they wouldn't get any of my money, they had photocopies of knitty patterns for the taking. Which is a big knitty no-no. (Yes, I reported them). So I thought I was safe. I didn't need any yarn anyhow. Until I got to the hotel in Champaign-Urbana, Illinois. There was a free magazine in the lobby. Do you know what was on the cover of the free mag? A yarn store! It was fate. And the store was only a few miles from the hotel. So I went there, praying for a better visit. I was not disappointed. Klose Knit is fabulous. It's an old converted house, and it's beautiful and cozy and welcoming. They were having a knit-in and they invited me to sit and knit. The owner walked me around to show me things. They even offered me pastries if I didn't have time to stay. So I had to buy just a few things. 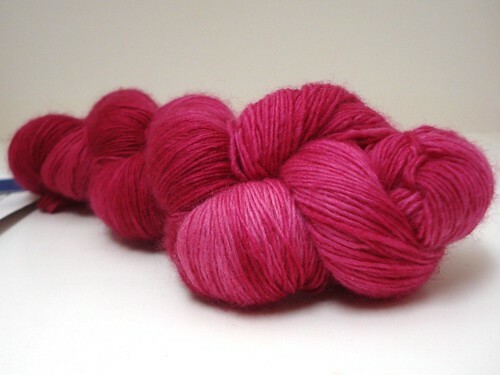 And then she mentioned she had Malabrigo Sock in Light of Love, which I can never get my hands on. 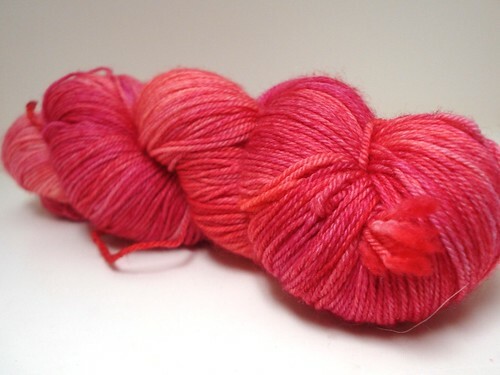 Apparently I can't photograph it either, but it's going to be perfect for my 3-Day Breast Cancer Fundraising Shawlette that I'm designing. So I was happy. The good yarn store balance had been restored. I had such a lovely time at Klose Knit. If you're in the area - or a reasonable drive - you must go! And I was happy in my yarnie world. But then I did a little google search. And there was another yarn store in the area. This one even closer to the hotel. So I left the menfolk in the room and decided to make a quick trip over. Needleworks has more buttons than I've ever seen in one place. I found the perfect buttons for a sooper seekrit project. They have a huge store. 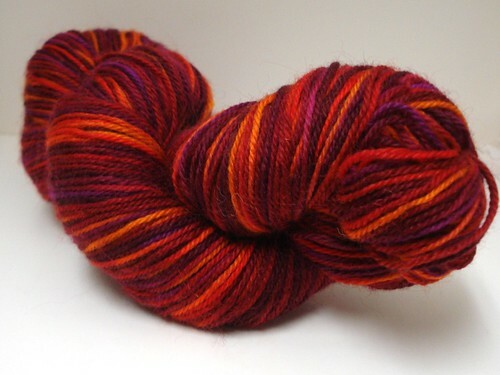 With sweater quantities and more of all sorts of gorgeous yarns. 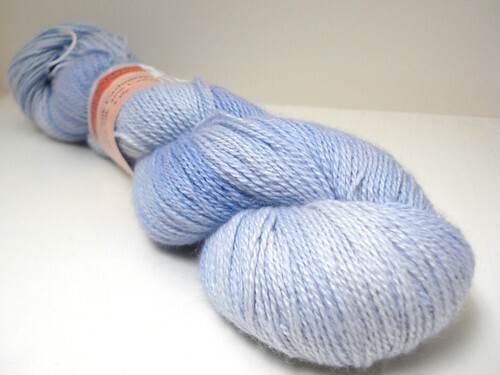 The yarn above is made for dyeing, but I thought it would be perfect undyed for a winter shawlette or capelet. Oh and did I mention it's baby llama? It's luscious! Oh and they were having a knit-in too! Everyone said hi and was super friendly. They do a potluck on the day I was there and invited me to stay for lunch! I wish I could have, but I spent an hour picking out perfect buttons, so I had to run! So now, things are even better. 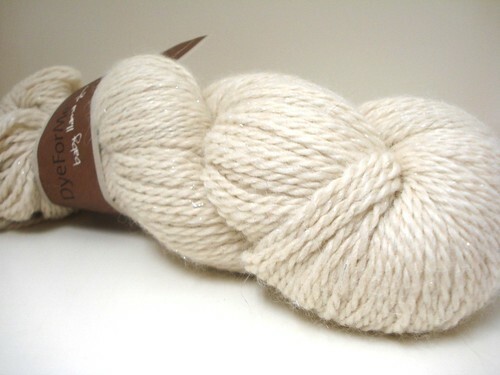 One very bad yarn store, two really wonderful yarn store experiences. I was good. I needed no more. But then the non-knitter we stayed with on the way home recommended a store. She doesn't even knit and she recommended it? I had to go! 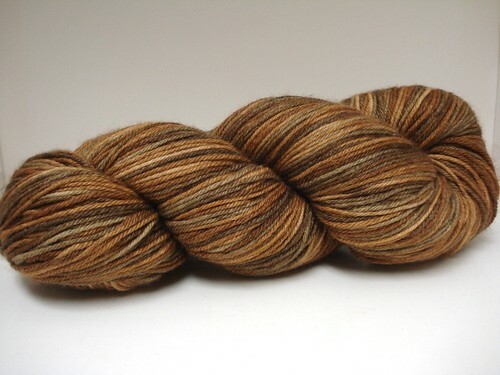 River Wools is also just fantastic. The lady at the counter was lovely and welcoming - showing me around and helping me find stuff. They had tons of gorgeous yarns. Right in downtown Terra Haute, Indiana. I had a lovely visit while the menfolk were off buying square donuts - which were pretty darn tasty by the way! So there you go. A 75% success rate. Three really wonderful yarnstores where they knew how to treat people and had delicious and beautiful yarns. So if you're in the midwest, all three of these are worth a road-trip and convenient to some major highways. Three thumbs up!